What is Mendability for Autism? Mendability® for Autism is a completely new, cost-effective, clinically validated therapy for autism. Mendability uses Sensory Enrichment Therapy™ to activate brain plasticity in kids with autism and help them overcome the symptoms of autism. The therapy involves parents or therapists administering non-pharmaceutical, carefully constructed sensory exercises. Mendability’s specific protocols of Sensory Enrichment maximize neuroplasticity and neurogenesis. In a recent clinical trial, following six months of therapy, 42% of the children in the enrichment group significantly improved in behaviors such as relating to people and responding to sights and sounds, compared to 7% of the standard care group, according to the study. The children in the enrichment group also improved on scores for cognitive function, which covers aspects of perception and reasoning, whereas the average scores for the children in the standard care group decreased. Will Mendability help my child? Although Mendability is very effective for young kids, it seems to also be effective for a wide range of ages, including teenagers and young adults. Mendability seems to be effective with a wide range of learning, behavior and language issues experienced by children with ADD/ADHD, PDD, Dyslexia, Aspergers, etc. Mendability is a Sensory Enrichment treatment aimed at prompting natural healing in the brain, thus potentially affecting all aspects of life that the brain controls. It is built on years of research with animals. Of course, even though many parents report success with the treatment, some children will not see results. It is very difficult to tell ahead of time which children will respond best to the therapy. However, parents/caregivers who perform the exercises with their child every day generally notice more improvement. There is really no downside to trying out Mendability. The therapy is administered daily through a few short, non-invasive sensory enrichment exercises, and is non-pharmaceutical. Take our Free Assessment tool and see what typical results we see in individuals similar to your loved one. Could some silly games really help my child overcome autism? Mendability has taken the principles of Sensory Enrichment and developed a program that adapts as your child improves. Most autism treatments only take your child’s brain strengths and weaknesses into consideration. Mendability goes a step further and also considers where the child is responding to therapy and when he is ready for more difficult exercises. Our proprietary software is based on the same mathematical structure used in Artificial Intelligence, re-engineered specifically for use in the selection of Sensory Enrichment exercises. In many ways the Mendability therapy is similar to a workout program. Just as a few key exercises done throughout the week help to build up muscle, a few well-placed and well-designed Sensory Enrichment exercises help build up the brain. Does Mendability only work with children? The clinical trials were specifically conducted on children. While we have not conducted an IRB clinical trial on adolescents or adults, the science of brain plasticity suggests that adolescents and adults may benefit from the treatment. And indeed we have anecdotal examples of teenagers and young adults who have improved while using Sensory Enrichment therapy. Does Mendability work on neurological conditions other than autism? Mendability for Autism is designed as a therapy for autism. However, the principles of Sensory Enrichment Therapy apply to neurological conditions other than autism. We have seen anecdotal success in using the therapy to treat other conditions but science has not yet validated these results. Does Mendability have side effects? Sensory Enrichment Therapy for autism provides simple, natural sensory experiences. Mendability is completely non-invasive. It does not involve any pharmaceutical products or any other kind of compound. However, the children who participate in Mendability are going through changes in their brains. In particular, during the first few weeks of therapy some children experience what many parents describe as “emotional storms”. This is normal. Then a couple of months into the therapy some parents describe their child as challenging them more. Many children with autism did not go through a “terrible twos” period in their early life. Now as they are becoming more aware of their surroundings and of the rules of society, they challenge those rules to understand how boundaries work. This too is a normal process. The best remedy is to directly discuss the concept of acceptable behavior with your child even if it is not clear whether he/she understands the words or the concepts you are conveying. How did you come up with the exercises? Mendability is built on a vast body of research done on animals in the areas of brain plasticity and environmental enrichment over the past few decades. What we have done is to gather that work and adapt it for human implementation. For example, pleasurable visual stimulation on cats can be applied with simple flashing lights. For human implementation we adapted the pleasurable visual stimulation to include engaging photographs and fine art. In other cases, such as olfactory stimulation, presenting a scent to an animal or to a human being is exactly the same procedure. Each of the exercises is designed to stimulate specific brain functions and collectively create a complete workout. The results have been validated in clinical trials. How long is the Mendability therapy? The duration of Mendability depends on many factors, chief among them is the severity of symptoms at the beginning of the program. While most parents are reporting visible changes in their child after just a few weeks of therapy, in order to create a substantial and permanent change in the brain we believe that the minimum duration for the therapy should be 6 months. Parents/caregivers that have administered Mendability beyond the 6-month mark, even with children that were only mildly autistic, continue to report improvements in communication, social and cognitive skills. Note that some parents report a plateau after 3-4 months of Mendability, with a few reporting that their child is experiencing difficulty with authority. It is very important to continue the therapy through that period for two reasons: First, the brain does not have a linear response – often the response comes in “jumps” followed by a plateau. Second, testing boundaries of what is socially acceptable is part of the normal process of growing up. Many kids with autism never experienced “terrible twos”. As they start to understand more about the world around them they may test those boundaries. It is a normal process (albeit somewhat frustrating) and should not deter you from continuing with the therapy. If my child does not like the pictures/scent/music, can I modify the exercises? Collaboration with your child is one of the keys to success with Mendability. If your child loves baseball, use baseball images. If your child does not like the smell of lavender, try a citrus scent. The goal is to work with your child until Mendability is as fun as it can be. What happens if I have to take a break and stop for a day or two? We know that life happens and we developed the program with real life in mind. This is why it is short, fun and enjoyable to do. It’s OK to miss exercises here and there. During your appointments/calls with your coach/therapist we will make sure to show you which exercises are the most important ones to fit into your day. If you stop the therapy for a day or two, resume as soon as you can and it won’t have any noticeable effect. However, the best results have been achieved in families that have methodically administered the therapy completely and continuously. The more completely you can follow the program the faster you will travel the road to recovery. Do I have to do all the exercises in order? Yes, the exercises are presented in the best order for them to have the benefits intended. Some exercises can be considered as warm-ups to prepare for other exercises. What do I do if my child doesn’t want to do the games or won’t cooperate? Our advice is to act as you typically would in a situation where your child does not want to cooperate. There is not one solution that works for every child. Patience will be essential, and it will be beneficial for you to read the advice given for each exercise and understand the minimum performance needed to get benefit from each exercise. These exercises are learning exercises and may take time to adjust to. In all cases, patience, love and understanding are your keys. A useful piece of advice is to discuss the benefits of the therapy with your child even understand what you are saying. How do I know that Mendability works? The first few weeks of the therapy are in most cases characterized by what many parents call “emotional storms”. If your child experiences unusual emotional responses, it is because Mendability is working. 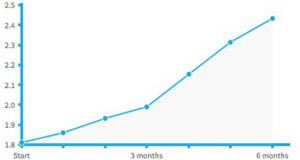 You will be able to see your child’s progress on a graph on your home page. This progress chart is intended to help you keep track of your child’s changes and new capabilities. For improvements to stick we recommend that you do the program for at least 6 months. For most parents what tends to happen first is improvement in the areas of awareness, attention, sensory processing, communication and social skills. Parents seem to report that cognitive abilities, motor abilities, etc happen later in the program, after 6 months of therapy. This is not a quick fix. Nothing really is. You should expect to be doing this program for at least a year. Then, when we reach a point where many of the troubling symptoms have mostly gone, you may want to ask yourself: “What can we work on next?” No-one knows where the limit is for how much more brain you can have. Do we have to go to your clinic for the therapy and where? Mendability can be administered at home by you, the parent or caregiver, which eliminates the need for therapy clinics. You can access your Mendability program online from the comfort of your own home, or wherever you have access to the internet. All families doing Mendability can call us at any time for a consultation with our specialists. Is Mendability covered by insurance? Mendability is not currently covered by insurance. All clients who wish to participate in the therapy will be responsible for the monthly cost. Click here to view pricing options. Where can the program be accessed?